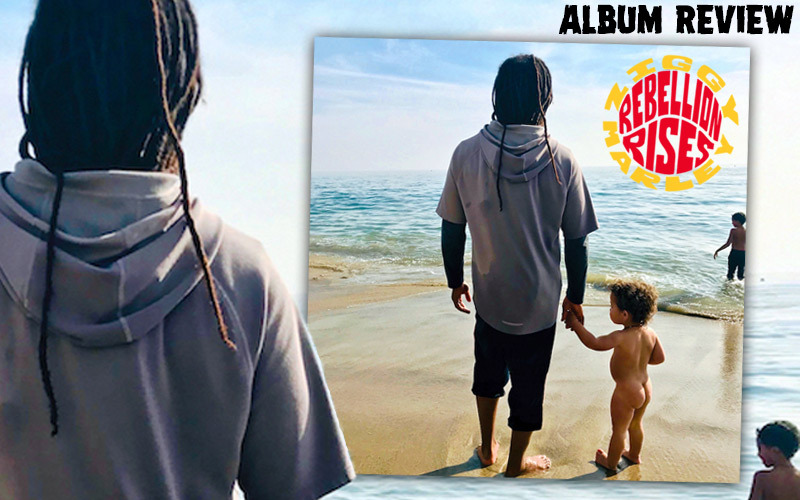 Rebellion Rises is Ziggy Marley’s seventh studio album as a solo artist. What makes his prolific ongoing output- a new studio release every two years or so- both continually relevant and critically notable is the way in which each latest effort builds on the prior entries in Marley’s illustrious catalog. It’s not that the multiple Grammy-winning singer morphs into a new character, or explores a new genre, so much as it is the unfolding experiences of the introspective journey that the reggae superstar is on; he’s gracious enough, almost reliably compelled, to take us with him. In the case of this record, it’s less vicarious and free as its predecessors. This is one that’s more a call to action: Marley wants you involved. He has tucked, and sometimes shouted, message into most of his writing over three decades as reggae’s most prominent voice, but often it seemed more reporter, less recruiter. Writing, arranging, and producing this album himself, these ten tracks, with a few exceptions, are rallying cries for humanity. Yes, the cause remains love, but this time Marley is calling to unite all the rebels for the cause. The album opens with the set’s most scathing indictment as a djembe rattles and horns shred their way through See Dem Fake Leaders. Marley’s son Gideon delivers a spoken-word bridge on The Storm is Coming, an autobiographical tracing of a phone call Ziggy and brother Stephen shared during hurricane season in Miami that plays as a metaphor for an encroaching political climate. Synth claps and electric guitar lines cycle through World Revolution, that touches on racial discrimination, also marked by a rap on the bridge- this one from an intern, SamuiLL Kalonji, Marley discovered at his record label office. The lighter empathy of Your Pain is Mine follows, with a verse melody reminding of an earlier Marley cut, Beach in Hawaii. Then, the arresting staccato Change Your World, utilizing the timeless boy-meets-girl backdrop as a metaphor for activism. Ska-like horns color the bouncy, bright wish list of I Will Be Glad, as one of Rebellion’s sunnier tracks, both musically and lyrically. High on Life is a bit of a throwback, evoking the innocent charm of Marley’s former group, sibling sensations The Melody Makers, then, fittingly welcoming Stephen for the subsequent Circle of Peace, that affirms the cause and petitions the willing to realize their dreams now. With strumming acoustic guitar and delicate piano runs, I Am a Human works to shed the labels of race, religion, and politics, and return the focus to simple humanity. The titular finale carries something of a core sentiment that has anchored Marley since the beginning. Even in the toughest of times, Ziggy Marley has remained optimistic. The minor-to-major-key shifting within the steady rock of this closer suggests a sense of sunlight emerging from the darkness; that love and peace will win the day. Rebellion Rises is not an angry record. It is not a bitter record. But, it is not a record of hope, either. The time of hoping for change is a notion Marley considers past due. This is a record of action, and for Ziggy Marley, the time for action is now.